Platform Problems is the temple level of Juicy Jungle in Donkey Kong Country: Tropical Freeze and the fifth Hidden Kong Temple level in the game. The level's main gimmick consists of platforms that move on tracks, with some of them flipping up on certain portions of their track, enabling the Kongs to stay on them. A few platforms are stationary, but will fall off their tracks as soon as the Kongs step on them. The level begins with a few platforms on tracks, as well as a few Hootzes to jump on. Afterwards, a few spikes appear, followed by a Puffton. The next segment features more platforms on tracks, as well as a few Hootzes and Blue Hootzes, and a few more spikes to avoid. The Kongs must then ride a few more platforms on tracks, then follow up by bouncing on a few more Hootzes, then make an S-curved turn while navigating more platforms on tracks. Afterwards, the Kongs must then jump from platform to platform as they flip up, jumping on Hootzes to stay on the platforms. After navigating these platforms, the Kongs must ride even more platforms on tracks, as they slowly descend, bouncing on Hootzes along the way. After one last platform on a track, the Kongs reach the Mysterious Relic. On the platforms with the upwards-arching track, the Kongs must collect all bananas to unveil the Puzzle Piece just up ahead. Upon reaching a thin S-curved track, the Kongs must jump up to the left to reveal a hidden alcove with the Puzzle Piece. Not long after the second Puzzle Piece, the Kongs must carefully jump to the left to reach a visible alcove with spikes to obtain the Puzzle Piece. 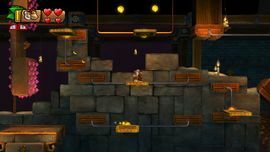 While jumping from platform to platform, just before the rightmost platform continues to the right, the Kongs must jump on the left platform and bounce off of some Hootzes to collect the Puzzle Piece. The Kongs must bounce off the Hootz just before the last platform on a track to obtain the Puzzle Piece. Two currently horizontal platforms moving in different directions. Note the darker portions of the tracks, where the platforms will be flipped vertically. Donkey Kong and Cranky Kong cause a stationary platform to slip off its track. The Kongs ascend using a series of elevating platforms. This page was last edited on August 31, 2018, at 10:19.